Pictured is a rendering of what the layout of the proposed welcome center in downtown Delaware would look like if the Sheets Building at 20 E. William St. is razed. For more than three years, the Sheets Building in downtown Delaware, located at 20 E. William St., has sat vacant and in disrepair. Owned by the City of Delaware and once used as the city engineering building, the circa 1880 structure was most recently used as office space in 2015. Now, the city has put together a concept review for the Delaware Historic Preservation Commission (HPC) that would turn the site into a city welcome center. At Wednesday’s (Nov. 27) HPC meeting, the city’s concept will be reviewed as a “jumping off point,” according to city documents, ahead of a potential request for a certificate of appropriateness from the commission to demolish the existing building. The city will also seek feedback from residents on what they would like to see included in the proposal. As the concept is currently presented, the building would be demolished to make way for an additional 11 parking spots on the site, increasing the total to 31. In addition to the added parking, public restrooms, a digital interactive wayfinding map, an arch similar to the Bun’s arch, and a walking path between the welcome center and the City Hall and City Hall Annex buildings are also included. The City Hall Annex, formerly the Gazette building, sits between City Hall and the Sheets Building, and is currently being renovated. 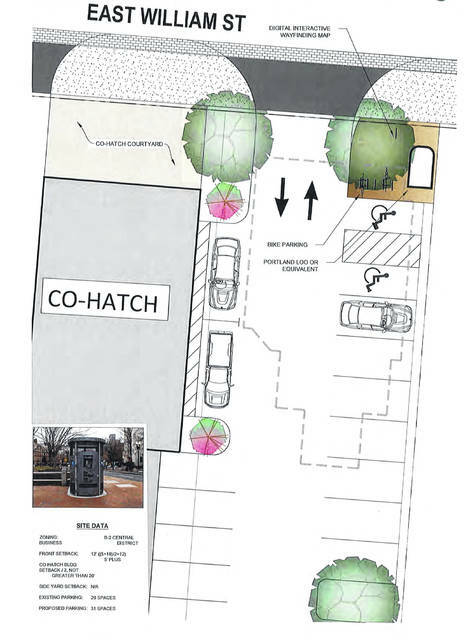 The second floor will serve as additional office space for city staff, and COhatch will lease the first floor and offer co-working space for small businesses and the general public. In September of last year, the city had proposed to demolish the building in order to “improve access to the (city) annex and garner additional parking spaces,” documents state. The proposal was tabled by HPC and ultimately withdrawn by the city after the plan was met with opposition from both HPC and residents. The document added that the building would require upwards of $200,000 in repairs to make the building useful again, and any repurposing would only create an additional need for downtown parking, which is already a top concern for the city. Along with the conceptual review of the welcome center, HPC will also discuss the 300-car parking garage and a 104-room hotel that has been proposed by the City of Delaware and Fairfield Inn and Suites by Marriott, as was reported on Saturday. HPC meetings are held in the city council chambers of City Hall, located at 1 S. Sandusky St. Meetings begin at 7 p.m.